Hello everyone!! If you live in the tropics like i do, you must know that there's no such thing as ''seasons'' during the year, there's only ONE in the DR (Dominican Republic) which is SUMMER, it's a ''Never Ending Summer'', it's hot all the time, people melts everyday, you can perfectly go to the beach on december, november, june.. it doesn't matter at all, there's no such thing as ''it's terribly cold'', no, it's less hot haha', so wearing high-waisted shorts and non-sleeve tops still counts on ''fall'' for us. I was completely melting when we were doing this shoot, i ended up with some coconut water to hydrate myself a bit. Hope you like this tons tons tons of hugs for you all. Hola a todos!! Si viven en el trópico como yo, deben saber que no existe nada llamado ''Estaciones del año'', solo hay UNA en RD (República Dominicana) la cual es VERANO, es un ''Verano Interminable'', hace calor todo el tiempo, pueden ir a la playa perfectamente un diciembre, noviembre, junio.. no importa. No existe nada como un ''Hace mucho frío'' no, hace menos calor haha', así que usar shorts de talle alto y tops sin mangas cuenta perfectamente para nuestro ''Otoño''. Hacía tanto calor cuando estábamos haciendo las fotos que termine bebiendo agua de coco para hidratarme un poco. Espero les guste, toneladas y toneladas de abrazos para todos. I just got a facebook page so i'd appreciate if you lovers go and follow over there. Me encantan los looks todos en blanco!! Beautiful!You are lucky to live in a warm environment. I am from Haiti. So I know exactly what you are talking about. It gets little cool in the morning during the winter, though. You look gorgeous as usual. You always have a cool photos! haha im sure i'll be jealous of your never ending summer once the winter cold hits, but for right now i'm pretty excited to bust out the sweaters ;) but i LOVE your shorts- they're such a cute shape! Love the casual chic look, perfect for summer! Do visit my blog and if you like follow on Bloglovin, twitter, Instagram & Facebook, leave a comment and I'll follow back! Followed back dear on twitter, FB & Instagram! Such a great outfit! I am definitely missing summer right now! Pretty envious of the beautiful weather! It's been cold and rainy here. I can't even imagine living somewhere where it feels like summer all year round! I can't stand the heat, so I know I wouldn't make it hah! Love your outfit though, it's really cute! Love the white on white! It's perfect for summer weather. it's definitely still summer down here too. great all neutral look! I love a neutral outfit, you look great! Cool outfit and great photos! 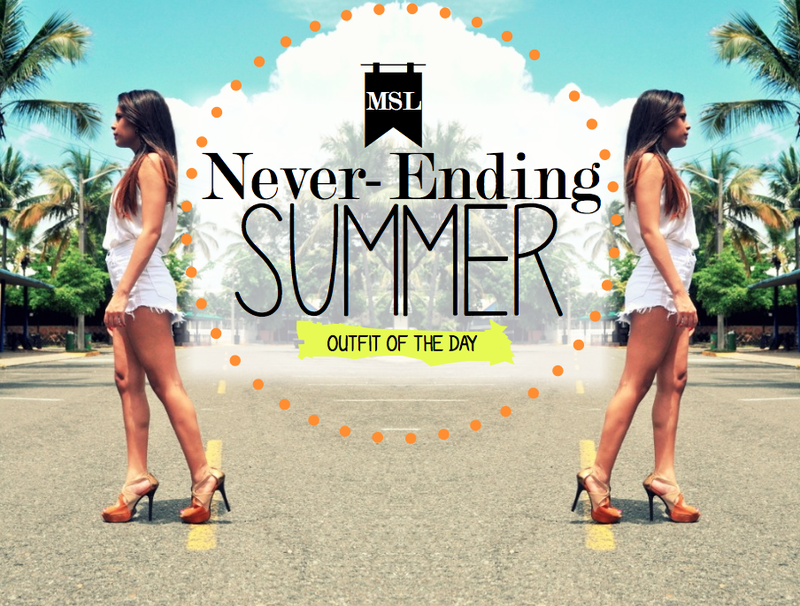 i love this outfit!, these type of shorts are perfect for summer time!, so fresh and summery! anyway, have a great day mandy! You look chic and you definitely have your own sense of style! Thank You for sharing such a nice post! Un look genial, muy bonitas las fotos! Great pictures and lovely blog! Looking stylish, the effects of these photos are wonderful. i love those outfits here in your blog. I'm following you now. <3 I love your blog. You're a definite knock-out in that outfit ! damn, your pics are awesome! + your outfits! you've got a great sense of style! how amazing to have a never ending summer! I would love that if i never had to work! I love autumn though and all the scarfs and jumpers i get to buy. Do you ever feel like you are missin gout or do you love spending eveyday in the beautiful sunshine? Me encantan las sandalias y los shorts! Un look genial! Thanks for the comment on my blog and thank you for following! I followed back! Cute outfit! I like the destroyed cutoff shorts and the all-white outfit! Followed back. i love how white and bright your outfit is! Thanks for stopping by my blog! i'm now following you on GFC too! Beautiful outfit and pictures, you look great. Here is very cold and raining. Great outfit and you are so lucky to get summer all year round!...The most I get is 2 months of summer. Thank you for leaving a comment on my blog and also following me. I am now following you too :) Looking forward to more amazing posts! really love your looks, very natural and you are real pretty! here's my version of boho, Not that good but my own. que bonitos te quedan esos shorts! Muy guapa cn el total white. Gracias por pasarte por mi blog! yo tb te sigo! Como me gusta el look en blanco estas guapisima! Me gustan muchísimo tus zapatos. you look so pretty! I follow you now too! we love summer, and in particular summer fashion so we wished that AUstralia only had a single season!! ALthough we can't really complain beacuse it doesnt really get all that cold here in winter anyway! ¡Me encantan los zapatos! Una monada. ¡Besos! Thanks for following :) i just followed you back through GFC and liked you Facebook page! You have a really nice blog here, keep up with the good work! Such a stylish white outfit! Would you like to follow each other via GFC, bloglovin' and facebook? I adore this outfit and you look so pretty ! it's sooooo cool that you can still wear short! in my country fall it's taking slowly but surely its rightful place!!! love how you styled the outfit ! En cuanto al look... me gustan mucho los shorts!! Love your blog - followed right back! Great outfit! Love the white cut-off shorts!! Awesome pictures, you look fabulous! WOW!!! I love your Style so much!!! You looks so Beautiful!! I love your blog! Would you like to follow each other on GFC? Hey!! Me gustó muchísimo este outfit :) Ya te sigo en GCF (618) me sigues?